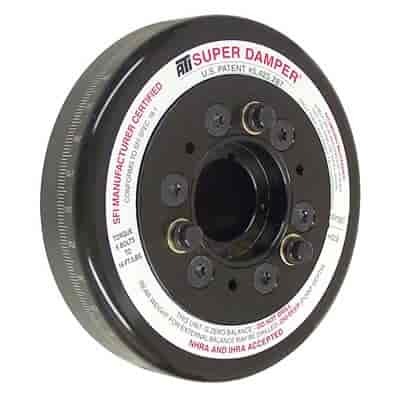 ATI's patented Super Damper is the only harmonic balancer developed exclusively for high-RPM performance engines (6000+ RPM). Its proven elastomer design is 2-in-1: a 4" diameter damper and a 7" diameter damper in two shells that bolt to the crank hub. Inner and outer shells are aluminum or steel to contain the steel inertia weight. The inertia weight has eight computer-machined grooves to retain the proper durometer O-rings (installed at ATI and dyno tested for each application). O-ring life has been tested in Winston Cup competition over two million cycles and in drag racing engines for 10 years (exceeds SFI 18.1 specs). Units can be rebuilt by installing new O-rings. Shells have a black zinc chromate finish with computer-controlled, laser-engraved 360° timing marks.